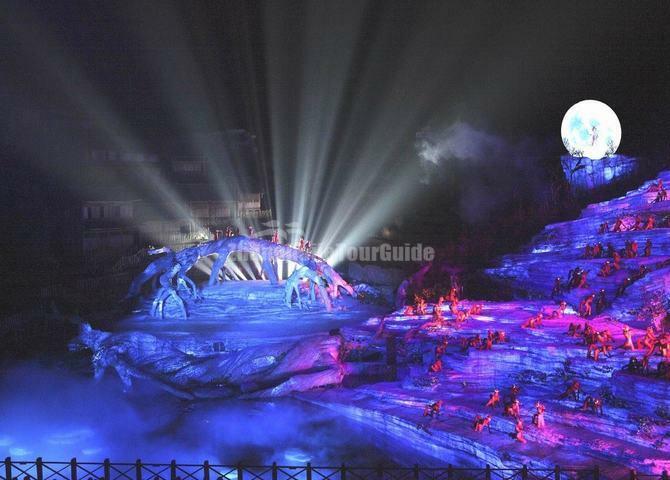 Known as the world's first real-scene musical drama with the high mountains and deep valleys as the stage background, Tianmen Fox Fairy Show was put on at the foot of Tianmen Mountain, Zhangjiajie in September, 2009. Originated from a traditional Chinese myth and folk tale - "Love between Man and Fox", the drama integrates the elements of folk music and modern art. As the story progresses, you will find settings everywhere from the foot of the hill to the peak, be it spotlight, stage for the chorus, background houses and so on. The visual presentation is spectacular and amazing, the music is impressive, and those dancers and singers are also charming. There is an old saying goes that Towering Tianmen Mountain, Vast Tienmen Hole. In the majestic precipitous Wuling Mountains, there is a 5 km long canyon with an elevation of more than 1,000 meters above sea level. In the canyon, there are herbs here and there, gurgling streams, and clouds overflow from valley time to time, where just like paradise. The main stage of Tianmen Fox Fairy Show was built here, melting with peaks, valleys, forests, and waterfall into one to form the only mountain canyon big stage of the world! The center stage is set up on the valley, making a perfect blending of the surrounding natural rocks. 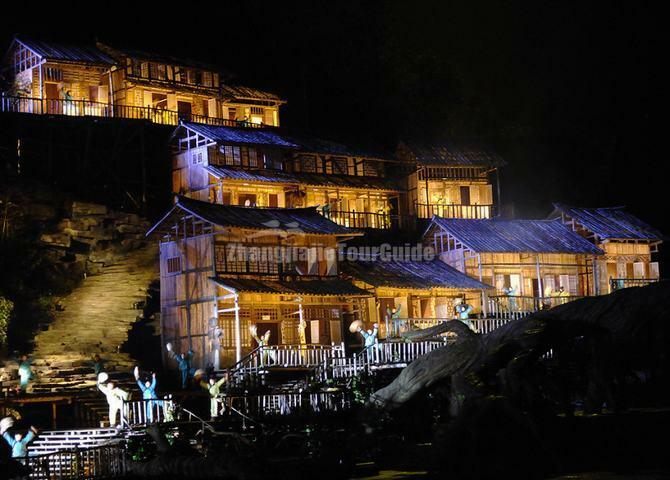 There are more than 10 authentic Tujia huts built on mountains and contiguous forming a distinctive village of Xiangxi. All huts are made of special materials, which can transform color as the evening light. The terraces, wooden bridge, and water tankers far away are also distant echoes with the village. By reconceived and ingenious choreography of Hunan folkloric classic love story “Liuhai Kan Qiao”, under the guidance of melodies, as well as integrate into the folk and folk songs of Sangzhi and Tujia，the show re-tells the twists love story between Man and Fox. 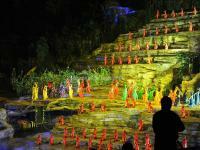 Tianmen Fox Fairy Show is composed of five scenes. The fox king select wife, the chance encounter in Fairy Mountains, the lovesickness in moonlight, the tornado of betrayal, and the millennium waiting. This is a real landscape stunning show. In the large real scenes, the tortuous and romantic love experience between Liuhai and white fox is particularly touching and makes people envy. 1. The show is open to the audience from March to the following December. It has a rest between Jan. to Feb. every year. 2. The theater will provide free raincoat to audiences if it rains. 3. The show is performed at night. It is suggested that audiences should bring a coat to enjoy the show for it is a little bit cold at night. Or visitors can rent a coat, which costing RMB 10. 4. There are Chinese, English, Korean and Japanese on the screen, so do not worry about language difference.